In 2012, things were pretty good for southern yellow pine (SYP) sawmills. Those that survived the US housing crisis and the Great Recession were making decent profits for the first time in years, most had their pick of the abundant timber supply, and the future looked pretty good. In that year, the average mill was producing about 125 million board feet and they were doing it in only about 60 hours per week, which was more volume than they had produced before, and in fewer hours. Many were bumping up against kiln drying constraints and couldn’t produce more lumber even if they were to run the standard 80 hour week. At that time, only a few mills in the US South were capable of producing more than 200 million board feet in a year. It’s fair to say that SYP sawmillers weren’t content to rest on their laurels. Fast forward just a few years and things are currently changing dramatically. A rash of new sawmills has been announced across the southern yellow pine region, and most of them boast annual capacities of 250 to 350 million board feet. Existing mills are also expanding—adding drying capacity, running longer hours and upgrading equipment to take advantage of the plentiful supplies of SYP timber. The Beck Group projects that average SYP sawmill production levels will rise from 125 million board feet in 2012 to over 200 million board feet a decade later. How does this compare to other regions? 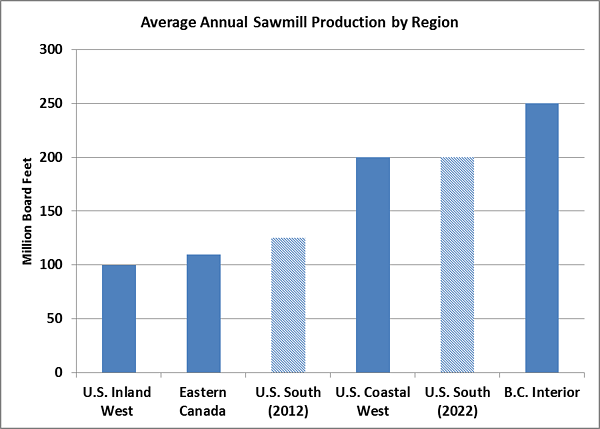 The following chart illustrates the relative scale of sawmill operations in key production areas of North America. As the chart indicates, southern yellow pine mills will rival production levels of their counterparts in the US Coastal West region. However, large scale mills in the British Columbia (BC) Interior will continue to hold the top ranking for annual production per mill. This change in scale will have significant impacts on productivity and manufacturing costs, delivered log costs, and other operating metrics in the coming years. We will explore these effects in a continuing series of blog posts related to the changing dynamics of the North American lumber trade and the expansion of new southern yellow pine sawmills. We will also illustrate how Sawmill TQ can help sawmills throughout the US South improve efficiencies and maintain profitability in the coming decade.